That’s a huge opportunity, but it also represents a daunting challenge for traditional restaurateurs, who may feel whipsawed by sector-transforming trends. Many traditional operators are wondering how they can succeed in a competitive industry that is evolving faster than ever before. New artificial intelligence (AI) tools can be the answer. Forget about robots racing through the front of the house to fill coffee cups and water glasses. The real value of AI and machine learning in the restaurant business is its ability to help restaurant operators gain control over trends (both in food service and ingredients), deliver better experiences to guests, and improve convenience and operations overall. Because the industry is competitive and profit margins are typically small, restauranteurs tend to be risk-averse, attempting to reduce the chance of failure to zero with careful planning and lengthy testing when contemplating a new product or service rollout or change in the product mix. That way of thinking doesn’t work in today’s world, where trends cycle much more quickly. Restaurants usually have a ton of data on hand, and much more is available to them, often for free, but too many aren’t using it. There’s anxiety within the industry about the complexity of AI. But AI solutions have matured greatly over the past several years and can now be as easy to use as asking a question. To succeed in today’s environment, restaurants have to take advantage of their data, iterate quickly, learn from failures and launch innovations fast. The real value of AI and machine learning in the restaurant business is its ability to help restaurant operators gain control over trends, deliver better experiences to guests, and improve convenience and operations overall. In one real-world example, an operator with outlets in Miami and Chicago used AI to optimize the beverage mix, leveraging in-house data plus freely available information, such as weather data. Without a lengthy planning or testing phase, the operator quickly conducted A/B tests, used AI to get recommendations, and improved revenue by 3 percent almost immediately. The demographics of restaurant owners aren’t always a perfect match with their customer base, so it’s easy to lose touch with emerging customer demand. The tools customers use to discover new restaurants and learn about food trends has changed too. Millennials may hear about a trend through a friend or influencer’s Instagram account, for example. They crave an authentic experience, and to succeed, restauranteurs better be prepared to deliver. AI can help restaurants stay on top of emerging trends since it can process more data and spot patterns more quickly than a human could. AI gets smarter as it takes in more data from a variety of sources. With the right AI strategy, restaurants can see trends coming sooner and shift operations to meet customer experience expectations — and drive revenue higher. Retailers are already taking advantage of this type of AI application to generate higher profits. One retail company with multiple outlets recently learned to customize promotions by location more effectively, using data on their product mix by store to zero in on customer preferences and customize offers. They now test concepts quickly and have accelerated the go-to-market process, which has had a tremendous positive impact on sales. Disruptive restaurant formats with a heavy emphasis on convenience are gobbling up a greater share of the overall restaurant market each year. Consumers have busy lives, and their expectations about where and when to share meals are changing. With an AI solution onboard, restaurant operators can see the changes coming and respond quickly. It’s important to understand that as digital transformation drives change across all industries, the winners and losers in the digital economy are being decided right now, and their fate will be clear in five to 10 years. The good news is that there’s still time for traditional restaurants to get in on the ground floor of the digital revolution and future-proof their businesses. But time is of the essence for at least two reasons. The first is that change will continue to accelerate, and those who are left behind will find it increasingly difficult to catch up. The second is that AI gets smarter over time, so the sooner restaurant operators put an AI solution in place, the more quickly the value AI delivers can cascade across the entire operation. Unless they’re operating a Jetsons-themed restaurant, owners of traditional eateries probably won’t be deploying a burger-grilling robot anytime soon. But now is the time for restaurant operators to embrace innovation and bring a customer service-focused AI solution on board. Being more attuned to customer demand through AI can save traditional restaurants. 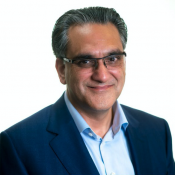 Anil Kaul is Co-Founder and CEO of Absolutdata. He has more than 22 years of experience in advanced analytics, market research and management consulting. Prior to founding Absolutdata, Kaul worked at McKinsey & Co. and Personify. He is also on the board of Edutopia, an innovative start-up in the language learning space. He has published articles in McKinsey Quarterly, Marketing Science, Journal of Marketing Research and International Journal of Research. He was recently listed among the ‘10 Most Influential Analytics Leaders in India’ by Analytics Magazine India and has been quoted as a “Game Changer” in Research World.